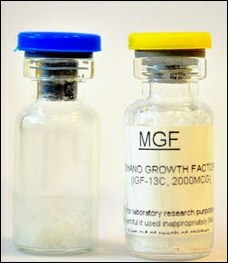 Vials containing Mechano Growth Factor (MGF) have been available for several years from online shops selling research chemicals and steroids. The compound also goes by the name IGF-1Ec. Two ampules found their way into the hands of the Doping Control Laboratory in Ghent, Belgium. Analyses showed that they were genuine. Mechano Growth Factor is an isoform of IGF-1. It resembles IGF-1 and is made in muscles cells by the IGF-1 gene, but it isn't IGF-1. Without going into too much detail, cells can read the genes in their DNA in different ways. Biologists used to think that every gene contained a blueprint for one protein, but the reality is more complex. And the same is true for the IGF-1 gene. If you train your muscles or expose your cells to androgens or growth hormone, the muscle cell refers to the IGF-1 gene. This gene contains the instructions for IGF-1, but also instructions for Mechano Growth Factor. IGF-1 consists of 70 amino acids; endogenous MGF contains 23. Mechano Growth Factor is active immediately after muscles have been trained. It stimulates stem cells to become part of the muscle tissue by transforming themselves into young muscle cells. According to the theory IGF-1 induces the young muscle cells to grow into mature muscle cells. [Endocrinology. 2010 Mar; 151(3): 865-75.] Mechano Growth Factor probably works through a different receptor than the one for IGF-1. But that's enough theory. Back to the Belgian analyses, which were published in March 2012 in Rapid Communications in Mass Spectrometry. The researchers analysed the contents of an unlabelled vial that customs officers had confiscated, and the contents of a vial they had bought themselves in an online store. Both preparations are shown below. Click the pic for the original. The unlabelled vial contained 10 mg white powder; the online-store vial contained 30 mg. The label of the latter bore the following text: "Mechano Growth Factor - IGF-13c – 2000 mcg - This product is for laboratory research purposes only. Can be harmful if used inappropriately. Keep out of the reach of children." According to the researchers the term IGF-13c is incorrect: it should be IGF-1Ec. The article does not disclose how much active ingredient was in the vials, but it does say which compound the researchers detected. In both cases it was Mechano Growth Factor, or rather, an analogue of it. At the end of the chain that chemists call C-terminus there was an amide lysine group, as a result of which enzymes break down the substance less quickly. The label on the vial doesn't mention this modification. Another aspect of the label that is not acceptable, say the researchers. It's possible that this modification has consequences for the effects that the preparation may have. "The difference between the declared active compound and the real compound present in the black market product can have unpredictable biological and toxicological effects as well as an effect on the detectability", they write. They emphasise that little is still known about the effects of MGF on humans, and that the version found in the vials "is not even described in the literature as a therapeutic candidate".